SOLID! Drumstick Holder – Highest Quality! Got some drumsticks that you want to show off? Then this quality Drumstick Holder is just what you’re looking for! It’s the best way to display your favorite drumsticks whether they are the sticks you caught at a concert, the signed collector’s drumstick of your favorite drummer or just the coolest pairs of unique drumsticks that you own. This high-quality Drumstick Holder can stand on its own or be mounted on the wall (mounting holes included). It can hold up to 6 pairs of drum sticks, including over-sized sticks, mallets, and brushes. Currently available in popular “black” color. A quality drumstick display case, built by an expert craftsman specifically for drummers and made to the highest to the highest of standards. Stronger than wood! 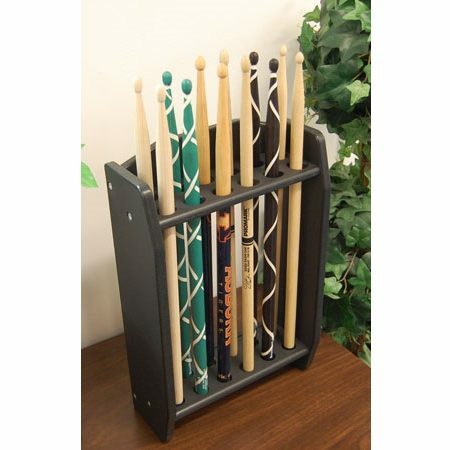 This hard composite drumstick rack blows all the others out of the market! You’ll be impressed by the solid workmanship. Proudly Made in the USA. Approx. 14″ H x 9.5″ W x 4″ D. See more below.